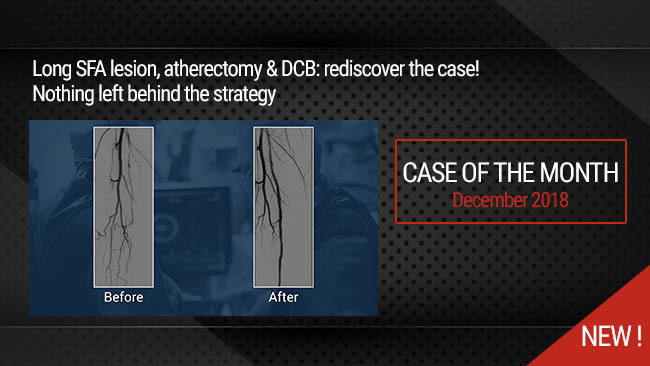 This didactic procedure concerns a young heavy smoker lady with bilateral lower limb severe claudication, presenting distal abdominal aortic calcified stenosis extending to bilateral common iliac arteries. After multimodality assessment of lesions, she has undergone percutaneous abdominal aortic & bilateral iliac angioplasty and stenting with good final result. How to manage patients with intermittent claudication and Aorto-iliac stenosis. Multimodality assessment of aorto-iliac stenosis before the intervention. How to plan access, procedural steps, and selection of devices. How to preserve inferior mesenteric artery during distal abdominal aortic stenting. Selection of femoral site: Left Femoral artery access with 7F 23cm introducer. Right Femoral artery access under Roadmap guidance (6F 23cm introducer). Crossing both iliac arteries & Aortic stenosis with 0.035" Advantage guidewire (Terumo). Aortic predilatation with a 10x40mm at 8ATM. Autoexpandable Stent implantation in the distal Aorta under Roadmap guidance: OPTIMED 12X40mm over the 7F Sheath. Recross the aortic stent with the right 0.035" guidewire. Simultaneous deployment of Two covered stents in both common iliac arteries BEGRAFT(Bentley): 7x37mm il the right side & 7x27mm in the left side. Kissing balloon with the stent balloons. Angiographic control in different views with good inferior mesenteric artery patency. Bilateral femoral arteries manual compression. Authors: Taeymans K, Goverde P, Lauwers K, Verbruggen P.
Authors: Vincent Jongkind & al. Authors : Beate Maria Stoeckelhuber & al.